Organic Cocoa Powder, Organic Coffee Bean, Organic Hemp, Sea Salt. 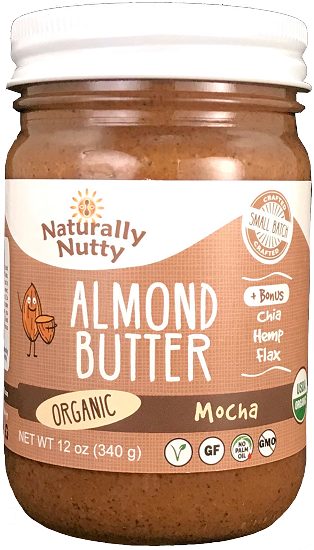 Our organic mocha almond butter is made with organic almonds fresh from California along with organic fair trade coffee (Higher Grounds), organic cocoa powder and Chia, Hemp and Flax seeds to increase the health benefits. You can't taste the chia but we added it because this ancient South American seed packs protein, fiber and antioxidants like nothing its size! 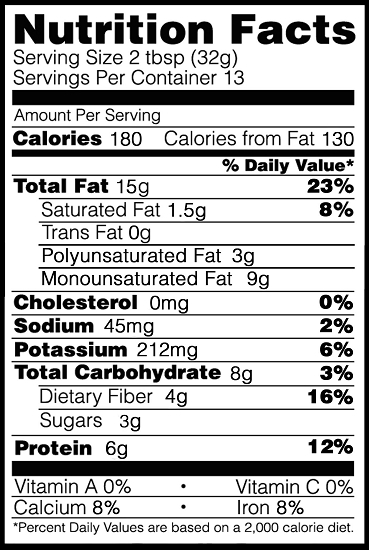 Wow, what a combo of ingredients and flavors! Tim's favorite right now! Ingredients: Organic California Roasted Almonds, Organic Semi Sweet Chocolate, Organic Flax, Organic Sugar, Organic Chia, Organic Cocoa Powder, Organic Coffee Bean, Organic Hemp, Sea Salt.